Do you represent a Headhunters Agency? Get listed in our country-wide directory. Our Free starter package allows you not only to be part of simple listing but gives you a full dedicated web page on our website. By default, inspired from your Website. You may also prepare a exclusive text to make your Page in our directory more specific and appealing. To be listed is essential, but to get the best results you have to stand out. In order to let you do just that, we offer you 3 premium packages that will give the more serious companies a lot more visibility across the directory. 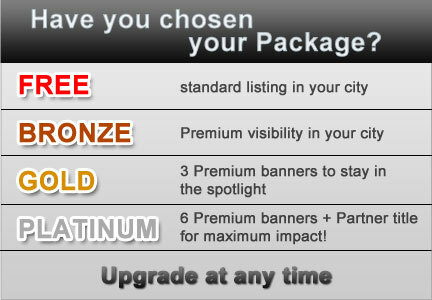 The premium packages come with a placement selection of premium banners. Each banner contains a full summary of your informations and is displayed above the standard listings, giving you a lot more visibility. FREE Package - Get listed fast and easy BRONZE Package - 99$/year - Premium banner in your city GOLD Package - 199$/year - 3 premium banners PLATINUM Package - 399$/year - 6 premium banners throughout the directory!